The neuronal α4β2 nicotinic acetylcholine receptors exist as two distinct subtypes, (α4)2(β2)3 and (α4)3(β2)2, and biphasic responses to acetylcholine and other agonists have been ascribed previously to coexistence of these two receptor subtypes. We offer a novel and radical explanation for the observation of two distinct agonist sensitivities. Using different expression ratios of mammalian α4 and β2 subunits and concatenated constructs, we demonstrate that a biphasic response is an intrinsic functional property of the (α4)3(β2)2 receptor. In addition to two high-sensitivity sites at α4β2 interfaces, the (α4)3(β2)2 receptor contains a third low-sensitivity agonist binding site in the α4α4 interface. Occupation of this site is required for full activation and is responsible for the widened dynamic response range of this receptor subtype. By site-directed mutagenesis, we show that three residues, which differ between the α4β2 and α4α4 sites, control agonist sensitivity. The results presented here provide a basic insight into the function of pentameric ligand-gated ion channels, which enables modulation of the receptors with hitherto unseen precision; it becomes possible to rationally design therapeutics targeting subpopulations of specific receptor subtypes. The nicotinic acetylcholine receptors (nAChRs) are members of the Cys-loop receptor family of pentameric ligand-gated ion channels. The neuronal α4β2 receptor is widely distributed in the mammalian brain and thought to be responsible for nicotine addiction and to play a central role in several psychiatric and neurodegenerative disorders (Jensen et al., 2005), which makes it a highly important therapeutic target. α4 and β2 subunits can assemble with different stoichiometries to form two distinct functional receptor subtypes, (α4)2(β2)3 and (α4)3(β2)2 (Nelson et al., 2003; Moroni et al., 2006). Both subtypes may be pharmacologically important because they seem to be present in native brain (Marks et al., 2007) and they display significantly different physiological properties (Nelson et al., 2003; Kuryatov et al., 2005; Moroni et al., 2006, 2008; Tapia et al., 2007). Expressing α4 and β2 subunits in equal amounts in oocytes gives rise to a receptor population, resulting in biphasic concentration–response curves to the endogenous ligand acetylcholine (ACh) and other agonists. The different agonist sensitivities are clearly related to the subunit stoichiometry, and, based on studies with different α4:β2 expression ratios and concatenated subunits (Nelson et al., 2003; Zhou et al., 2003; Kuryatov et al., 2005; Moroni et al., 2006; Zwart et al., 2006; Carbone et al., 2009), the high- and low-sensitivity components of the biphasic curves have been ascribed to the (α4)2(β2)3 and (α4)3(β2)2 receptor subtypes, respectively. Although mixtures of different stoichiometries can explain biphasic concentration–response curves, the lack of a detailed explanation for the different agonist sensitivities has made interpretation of certain experimental data difficult and has hampered rational drug design. Hence, a thorough understanding of the underlying mechanism is highly desirable and may be relevant to other Cys-loop receptors, including the major ganglionic nAChR α3β4 subtype, which also assemble in two different stoichiometries (Krashia et al., 2010). On the subunit level (Fig. 1A), both receptor subtypes comprise two α4β2 interfaces known to bind ACh. However, the (α4)3(β2)2 receptor contains a unique α4α4 interface, which we hypothesized to comprise a low-sensitivity agonist site. If agonist binding in the α4α4 interface is necessary to obtain full activation of the (α4)3(β2)2 receptor, this offers an explanation for the observed lower agonist sensitivity. The α4β2 nAChR subtypes and the agonists used. A, Diagram of the (α4)2(β2)3 and (α4)3(β2)2 subtypes showing arrangement of subunits and location of agonist binding sites. The black arrows show the position of the confirmed orthosteric binding sites, and the gray arrow show the position of the hypothesized third agonist site of the (α4)3(β2)2 subtype. (+) and (−) refers to the principal and complementary components of the binding sites. B, Chemical structures of the endogenous ligand for α4β2 receptors, ACh, and a partial agonist, NS3573. We constructed and compared homology models of α4α4 and α4β2 dimers and identified three differing key amino acids that likely affect agonist binding. We then introduced mutations in the α4β2 receptor to convert the low-sensitivity α4α4 site into a high-sensitivity α4β2-like site and vice versa to investigate whether these sites are responsible for the observed agonist sensitivities. The mutant and wild-type α4 and β2 subunits were expressed in different ratios in oocytes and tested with ACh and a partial agonist 1-(5-ethoxypyridin-3-yl)-1,4-diazepane (NS3573) (Peters et al., 1999) (Fig. 1B). Collectively, all our data are consistent with a third binding site in the α4α4 interface and show biphasic concentration–response behavior as an intrinsic property of the (α4)3(β2)2 receptor. The sequences of the ligand binding domain of α4 and β2 were retrieved from the Protein Knowledgebase (The UniProt Consortium, 2011; www.uniprot.org), entries P43681 and P17787, respectively. The structures and sequences of the templates were downloaded from The Protein Data Bank (PDB) (Berman et al., 2000) (www.pdb.org): the mouse α1 nAChR ligand binding domain with a toxin bound (PDB code 2QC1) (Dellisanti et al., 2007), ACh binding protein (AChBP) with nicotine bound (PDB code 1UW6) (Celie et al., 2004), and AChBP with epibatidine bound (PDB code 2BYQ) (Hansen et al., 2005). Preparation of the templates was performed by manual deletion of unwanted protein chains, residues, and heteroatom molecules. The alignment of the target and template sequences were initially created with EXPRESSO (Armougom et al., 2006) and then manually edited according to the following considerations: all three templates were used in regions with structural similarity, and otherwise 2QC1 were the template of choice excluding regions and residues that are structurally different as a result of the bound antagonist or mutated residues. The alignment with specification of which templates were used in certain regions is depicted in Figure 2. The homology models were prepared with MODELLER release 9v7 (Sali and Blundell, 1993), and nicotine was included in the dimer interface from the 1UW6 template. We built 100 models for each dimer and selected the best scoring models using the Discrete Optimized Protein Energy (DOPE) score (Shen and Sali, 2006) included in MODELLER. The selected α4β2 and α4α4 models were imported into PyMOL (DeLano, 2002) and overlaid by superimposing the chains that make up the (−)-side of the binding site. Sequence alignment used for homology modeling. The multi-template sequence alignment of α4 and β2 to the three templates used to construct the dimeric α4α4 and α4β2 homology models. The residues shown in bold were used as templates for modeling both α4 and β2, whereas framed residues were used only for α4. Residues that were not modeled on a template or not used as template are shown in gray. Numbering follows the PDB files for 1UW6 (AChBP with nicotine bound), 2BYQ (AChBP with epibatidine bound), and 2QC1 (mouse α1 nAChR ligand binding domain with toxin bound) and is according to P43681 and P17787 at www.uniprot.org for α4 and β2, respectively. The mutated residues are on a gray background, the secondary structure is indicated above the sequences, and the classical notation of the binding site regions (loops A–F) is given below the sequences. Preparation of wild-type, mutants, and concatenated α4 and β2 subunits. cDNA encoding human nAChR α4 and β2 subunits were cloned, and cRNA was prepared as described previously (Timmermann et al., 2007). 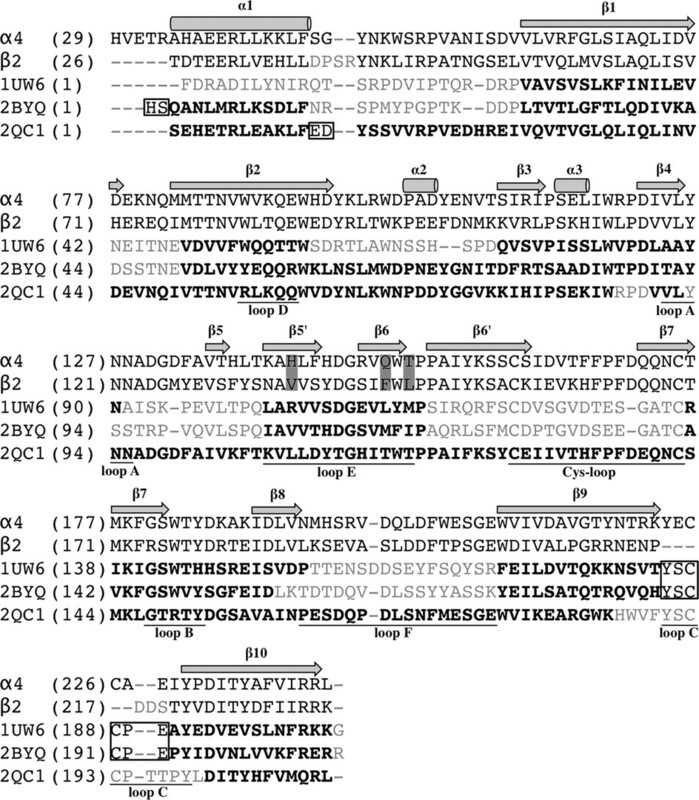 The triple-point-mutated β2m subunit with the mutations V136H, F144Q, and L146T was constructed by site-directed mutagenesis using uracilated β2 containing plasmid as template and a 5′-phosphorylated primer of sequence: CCTTCTATTCCAATGCgcacGTCTCCTATGATGGCAGCATCcagTGGacGCCGCCTGCCATCTAC (small letters indicate mutations) as described previously (Jensen et al., 2002). The triple-point-mutated α4m subunit with the mutations H142V, Q150F, and T152L was constructed by performing a restriction–ligation cycle substituting a large part of the N-terminal domain coding region with a ∼430-bp-long synthetic DNA piece purchased from GenScript using the HinDIII site in position 288 and a previously introduced SalI site in position 717. The nAChR β2-6-α4 concatamer (Zhou et al., 2003) was constructed by introducing half-parts of a linker sequence that contains an SacII restriction site into the 3′ end of β2 and the 5′ end of α4. The complete 20 aa linker sequence consist first of EG and then six in-frame AGS repeats (hence the “-6-” in the construct name) replacing the stop codon in β2 and the 24 aa signal peptide in the α4 subunit. Two primers were used for PCR reactions each with approximately a half part of the final linker: the β2 antisense primer sequence was gaattcgatcccgcggacccggcactgcctgcaccttcCTTGGAGCTGGGGGCTG, and the α4 sense primer sequence was cggatcctccgcgggaagtgctggaagtgctggaagtgctggaagtCGGGCCCACGCCGAGGAG (linker sequence written with small letters). After the PCR reactions, β23′-Linker and α45′-Linker subunit intermediates were constructed, and the final concatamer was assembled using the unique SacII site in the linker sequence. The nAChR β2-6-α4-9-β2-6-α4 concatamer was constructed in a manner similar to that described for the β2-6-α4 concatamer but this time using the β2-6-α4 concatamer itself as template for introducing half-parts of a linker. The 28 aa linker consisted of 9 (hence the “-9-” in the construct name) in-frame AGS repeats separated by an “extra” threonine residue between repeats 5 and 6 to introduce a SalI site and replaces the stop codon in the C terminus of β2-6-α4 and 25 aa signal peptide in the N terminus of β2-6-α4. The antisense primer used for a PCR reaction was ggcggccgcgtcgacccagcagaccccgcgctacctgcggatccagcactacctgcGATCATGCCAGCCAGCCAGG, and the sense primer used for the second PCR reaction was tggtaccgtcgacggctggaagcgcaggtagtgctggcagtgcaggttcgACGGATACAGAGGAGCGGCT (linker sequence written with small letters). The final β2-6-α4-9-β2-6-α4 concatamer was constructed by ligation of the two intermediates β2-6-α43′-Linker and β2-6-α45′ Linker using the unique SalI site in the linker. All constructs were verified by sequencing (MWG Biotech). Primers and oligos for mutations were purchased from MWG Biotech. Expand HF polymerase was from Roche Diagnostics. Restriction enzymes, T7 DNA polymerase, and T4 DNA ligase was from New England Biolabs. Escherichia coli XL1-Blue was from Stratagene. DNA purification kits were from Qiagen. Xenopus laevis oocyte preparation and electrophysiological experiments were performed as described previously (Mirza et al., 2008). Briefly, lobes from ovaries of female adult X. laevis were removed and defolliculated to obtain isolated oocytes. Oocytes were injected with a total of ∼25 ng of cRNA encoding human wild-type, mutant, or concatenated subunits (α4, β2, α4m, β2m, β2-6-α4, or β2-6-α4-9-β2-6-α4) in the ratios stated in Table 1 and incubated 2–7 d at 15–18°C. Oocytes were subjected to two-electrode voltage-clamp electrophysiological testing using a custom-built system in which solutions were applied directly to the oocytes via a glass capillary tube placed in the vicinity of the cell to ensure a solution exchange rate in the order of a few seconds. Each application of ACh or NS3573 lasted ∼1 min, and peak current amplitudes were measured. The protocol included dynamic adjustments of washing periods between applications to ensure full recovery at higher agonist concentrations. Data management and statistical analysis. Full concentration–response datasets for ACh were fitted using GraphPad Prism 4 to either a monophasic [I = Imax/(1 + 10(logEC50 − [ACh]))] or biphasic [I = Imax * Frac/(1 + 10(logEC50_1 − [ACh])) + Imax * (1 − Frac)/(1 + 10(logEC50_2 − [ACh]))] Hill equation, and the fitted maximal values (Imax fit ACh) were used for normalization of each dataset. In a similar manner, full concentration–response datasets for NS3573 were normalized to a maximal ACh stimulation (Imax ACh) on the same oocyte and then fitted to Hill equations as described above. GraphPad Prism 4 best-model F test was used to evaluate whether a given dataset was best represented by a biphasic or simpler monophasic model, and the results are written as F value (DFn, DFd). To compare fractions of high-sensitivity component among biphasic fits, the fraction was determined for each single concentration–response dataset using biphasic fitting and the fraction means were statistically compared using GraphPad Prism 4 one-way ANOVA. For comparing EC50 values, GraphPad Prism 4 unpaired two-tailed t test was used. 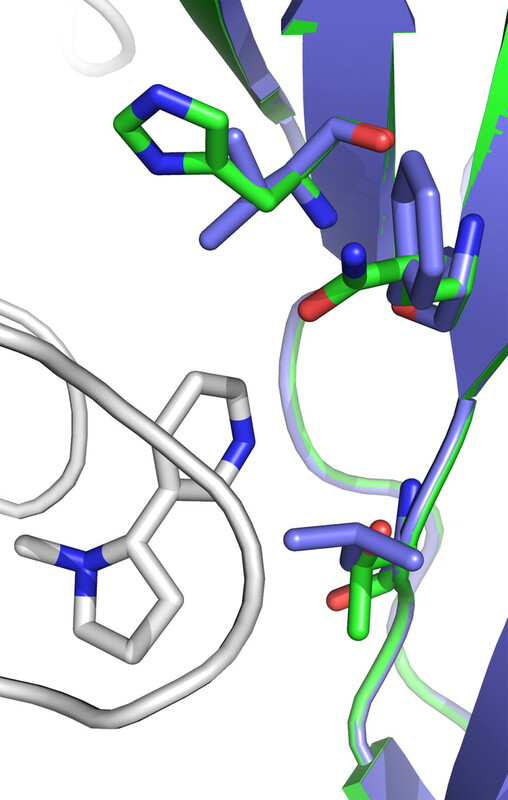 To compare the putative agonist binding site in the α4α4 interface with the known binding site in the α4β2 interfaces, we constructed homology models of the two dimers. As templates, we used crystal structures of the monomeric mouse nAChR α1 subunit (Dellisanti et al., 2007), and the homologous AChBPs from Lymnaea stagnalis and Aplysia californica cocrystallized with the well-known α4β2 agonists nicotine (Celie et al., 2004) and epibatidine (Hansen et al., 2005). Nicotine was included in the homology models during the model building procedure, and residues within 5 Å and with side chains pointing toward nicotine were defined as binding site residues. A superimposition of the two homology models showed that only three binding site residues on the (−)-side of the interface differ between the two sites (Fig. 3). The three residues are His142, Gln150, and Thr152 in α4 and Val136, Phe144, and Leu146 in β2 (see also the alignment in Fig. 2), signifying a local change of the binding site from hydrophilic in an α4α4 interface to hydrophobic in an α4β2 interface. To be able to convert the α4α4 site to resemble a α4β2 site and vice versa, we constructed two triple mutants: α4[H142V/Q150F/T152L] (α4m) and β2[V136H/F144Q/L146T] (β2m). Structural comparison of the α4β2 and α4α4 sites. Superimposition of the homology models of the α4β2 and α4α4 dimers with the protein backbone represented as cartoon, whereas nicotine and the three residues that differ between the sites are shown as sticks. From the top, these residues are His142, Gln150, and Thr152 in α4 (green carbon atoms) and Val136, Phe144, and Leu146 in β2 (slate carbon atoms). The identical (+)-side of the binding sites and nicotine are colored with white carbons and for clarity reasons only displayed from the α4α4 homology model. Initially, we expressed wild-type α4 and β2 subunits in oocytes in 1:4 and 4:1 ratios to obtain (α4)2(β2)3 and (α4)3(β2)2 receptors, respectively, and conducted concentration–response experiments on the resulting receptor populations with ACh and NS3573. As seen from the representative traces for ACh and NS3573 experiments (Fig. 4), a full concentration–response dataset is obtained from each oocyte. In general, we observe lower current amplitudes from receptors expressed with excess β2 subunits (Fig. 4A) and higher current amplitudes with a surplus of α4 subunits (Fig. 4B). Furthermore, when β2 is in excess, ACh and NS3573 yield concentration–response data that fit very well to a monophasic Hill equation, indicating a uniform (α4)2(β2)3 receptor population (Fig. 5A,C; Table 1). The 1.6 μm potency of ACh is similar to previously reported values for (α4)2(β2)3 receptors in oocytes (Moroni et al., 2006; Zwart et al., 2006; Carbone et al., 2009), whereas the 23 nm potency shows that NS3573 is a highly potent α4β2 receptor agonist. Representative current traces for ACh and NS3573 in two-electrode voltage-clamp electrophysiological experiments in X. laevis oocytes. A, ACh concentration–response experiment in an oocyte injected with α4 and β2 nAChR subunits in a 1:4 ratio (representing a low-current amplitude experiments). B, NS3573 concentration–response experiment in an oocyte injected with α4 and β2 nAChR subunits in a 4:1 ratio (representing a high-current amplitude experiments). Application of compound is indicated by a bar above each trace, and “C” denotes an ACh control concentration of 1 μm (1:4 ratio) or 10 μm (4:1 ratio), “M” denotes a 3 mm AChmax concentration, “B” denotes a buffer application, and the numbers 1–12 denote increasing concentrations of ACh or NS3573 in half-log unit increments with minimal concentration of 316 pm in the first application and maximal concentration of 100 μm in the last application. 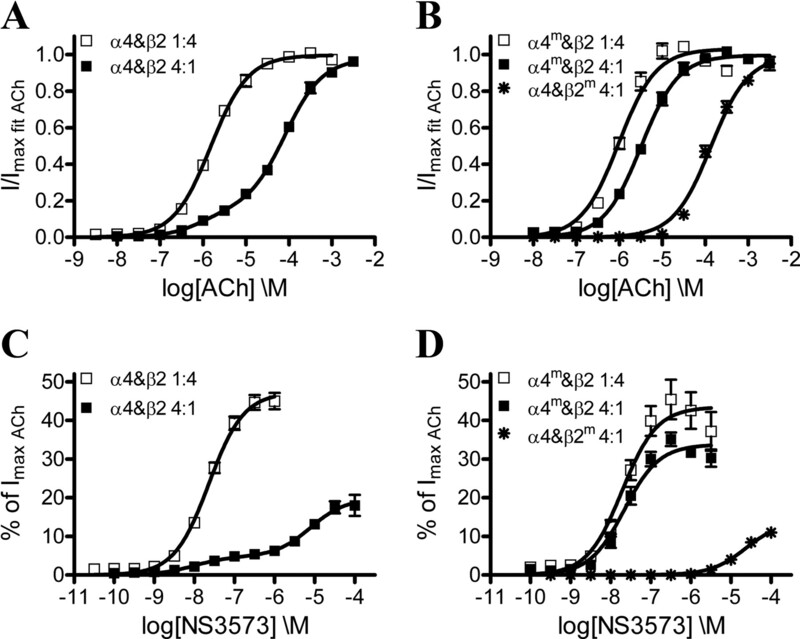 Functional concentration–response profiles of ACh and NS3573 on α4β2 wild-type and mutant receptors. A, ACh concentration–response curves from wild-type α4β2 receptors expressed in 1:4 and 4:1 ratios. B, ACh concentration–response curves on α4mβ2 mutant receptors expressed in 1:4 and 4:1 ratios and α4β2m mutant receptors expressed in a 4:1 ratio. C, NS3573 concentration–response curves from wild-type α4β2 receptors expressed in 1:4 and 4:1 ratios. D, NS3573 concentration–response curves on α4mβ2 mutant receptors expressed in 1:4 and 4:1 ratios and α4β2m mutant receptors expressed in a 4:1 ratio. Data points are presented as mean ± SEM. Potencies, fractions of the high-sensitivity component on biphasic curves, number of experiments, and statistics are presented in Table 1. Concentration–response data obtained from the receptor population expressed with excess α4 were significantly better fitted to a biphasic than a monophasic Hill equation (Fig. 5A,C; Table 1), yielding both a high- and low-sensitivity component for ACh (EC50_1 = 0.95 μm, EC50_2 = 83 μm) and NS3573 (EC50_1 = 9.8 nm, EC50_2 = 7.9 μm). The high-sensitivity potencies match those observed for the (α4)2(β2)3 receptors, whereas the low-sensitivity potency for ACh matches previously described values for (α4)3(β2)2 receptors expressed in oocytes (Moroni et al., 2006; Zwart et al., 2006; Carbone et al., 2009). The biphasic curves could be explained either as an inherent feature of the (α4)3(β2)2 receptor, resulting from the presence of two different agonist binding sites, or it could indicate a non-uniform (α4)3(β2)2 receptor population containing a small amount of (α4)2(β2)3 receptors. To investigate whether the biphasic concentration–response curves obtained from the (α4)3(β2)2 would change with varying α4:β2 expression ratios, we expressed α4 and β2 subunits in oocytes in 20:1 and 100:1 ratios and collected concentration–response data for ACh and NS3573. As for the 4:1 expression ratios, a biphasic Hill equation gave best fits (Fig. 6A,B,E,F; Table 1), and the fractions between the high-sensitivity and low-sensitivity components were not significantly altered for the two agonists as determined by one-way ANOVA (ACh: p = 0.54, F = 0.62; NS3573: p = 0.48, F = 0.73). Functional concentration–response profiles for ACh and NS3573 on α4β2 receptors with different subunit ratios or concatenated subunits. A, B, ACh concentration–response curves from α4β2 receptors expressed in 20:1 and 100:1 ratios. C, ACh concentration–response curve from α4β2 receptors expressed from the dimeric concatenated β2-6-α4 construct and α4 in a 1:1 ratio. D, ACh concentration–response curve from α4β2 receptors expressed from the tetrameric concatenated β2-6-α4-9-β2-6-α4 construct and α4 in a 1:1 ratio. E, F, NS3573 concentration–response curves from α4β2 receptors expressed in 20:1 and 100:1 ratios. G, NS3573 concentration–response curve from α4β2 receptors expressed from the dimeric concatenated β2-6-α4 construct and α4 in a 1:1 ratio. H, NS3573 concentration–response curve from α4β2 receptors expressed from the tetrameric concatenated β2-6-α4-9-β2-6-α4 construct and α4 in a 1:1 ratio. Theoretical sigmoidal curves using the obtained fitted values are plotted as dotted lines to visualize the two fractions. Data points are presented as mean ± SEM. Potencies, fractions of the high-sensitivity component, number of experiments, and statistics are presented in Table 1. In an additional attempt to ensure a uniform (α4)3(β2)2 receptor population, we used concatenated α4 and β2 subunits. In addition to the previously published dimeric β2-6-α4 construct (Zhou et al., 2003), we have prepared a tetrameric β2-6-α4-9-β2-6-α4 construct, in which the numbers between subunits indicate the number of peptide linker AGS repeats. Both concatenated constructs were then expressed with α4 subunits in a 1:1 weight ratio, and, given the absence of single β2 subunits, this should strongly favor assembly of receptors with the (α4)3(β2)2 stoichiometry. Again, the data for both tested agonists are best fitted to a biphasic Hill equation (Fig. 6C,D,G,H; Table 1), and the fractions are not significantly different from those of the individual subunits expressed in a 4:1 ratio (ACh: p = 0.16 F = 1.9; NS3573: p = 0.41, F = 0.90). Control experiments with the tetrameric concatenated constructs and β2 subunit in a 1:1 ratio yield potencies for both agonists (Table 1) that are not significantly different from those obtained with the 1:4 ratio as determined by t test (ACh: p = 0.15, t = 1.50, df = 16; NS3573: p = 0.30, t = 1.05, df = 28). Comparing fractions from all datasets, in the attempts to obtain uniform (α4)3(β2)2 receptor populations, by one-way ANOVA show that no single dataset has a fraction that is significantly different from the others (ACh: p = 0.51, F = 0.83; NS3573: p = 0.56, F = 0.75). If the low-sensitivity component of the biphasic responses obtained from (α4)3(β2)2 receptors originates from agonist binding in the α4α4 site, it should in theory be possible to alter this component by mutating the α4α4 site to resemble an α4β2 site. Thus, we expressed the above described α4m triple mutant in 4:1 and 100:1 ratios with wild-type β2 to promote and ensure assembly of (α4m)3(β2)2 receptors. Concentration–response datasets collected on the resulting receptor populations were best fitted to monophasic Hill equations, and the potencies obtained using the 4:1 ratio were 3.2 μm and 22 nm for ACh and NS3573, respectively, whereas the 100:1 ratio resulted in 3.8 μm and 27 nm (Fig. 5B,D; Table 1). This ACh potency was significantly different from that of (α4)2(β2)3 receptors expressed in the 1:4 ratio (p = 0.001, t = 4.27, df = 12), albeit the actual difference is of low magnitude (1.6 μm vs 3.2 μm), whereas the potencies for NS3573 were not significantly different (p = 0.85, t = 0.19, df = 23). 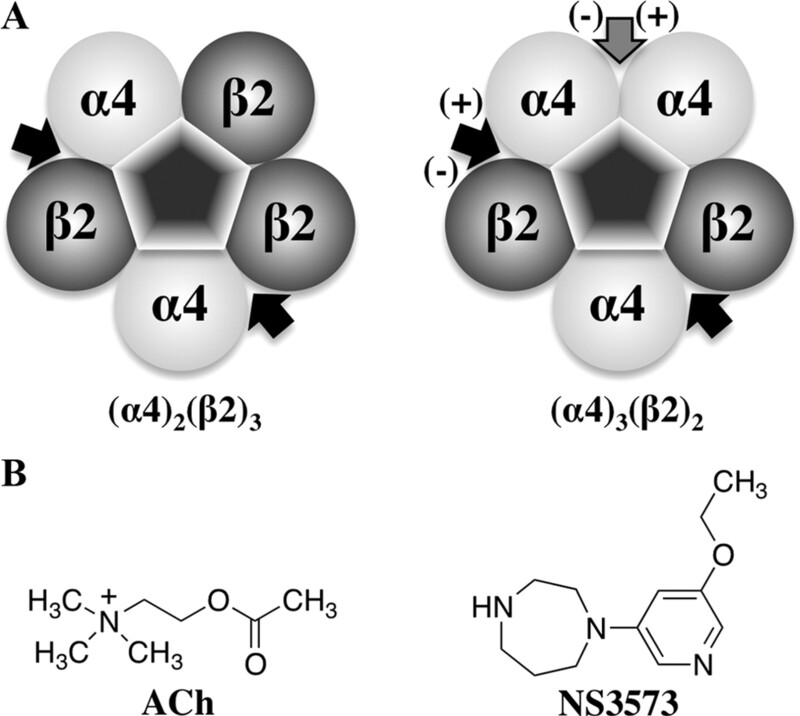 The (−)-side mutations of α4m are also present in the two non-binding β2α4 interfaces (Fig. 1A), and, to investigate whether this affects receptor activation, we expressed α4m and β2 in a 1:4 ratio. 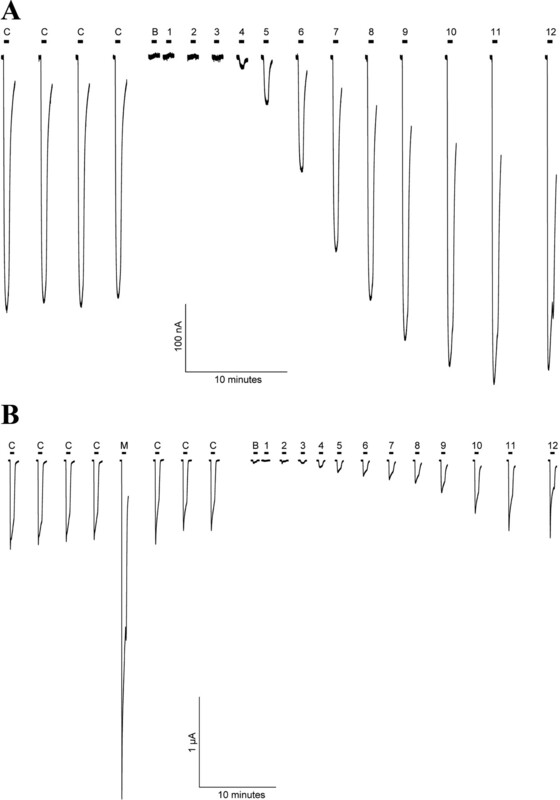 The resulting receptor population displayed monophasic responses to ACh and NS3573, which were virtually identical to those of wild-type (α4)2(β2)3 receptors with potencies of 0.97 μm and 20 nm, respectively (Table 1). The other way around, if the high-sensitivity component of the biphasic responses obtained from (α4)3(β2)2 receptors originates from agonist binding in the α4β2 sites, it should in theory be possible to alter this component by mutating the α4β2 sites to resemble the α4α4 site. Thus, we expressed α4 with the β2m triple mutant in a 4:1 ratio to promote assembly of (α4)3(β2m)2 receptors. Again, the receptors displayed monophasic concentration–response curves for ACh and NS3573, but this time with potencies of 140 and 23 μm, respectively, resembling the low-sensitivity potency component of wild-type (α4)3(β2)2 receptors (Fig. 5B,D; Table 1). Our results provide a novel explanation for the observation of two agonist sensitivities on α4β2 nAChRs and on how they are related to different subunit stoichiometries. The (α4)2(β2)3 receptor contains only one type of agonist binding site in the α4β2 interfaces, giving rise to a monophasic response with high agonist sensitivity. The (α4)3(β2)2 receptor contains two distinct agonist binding sites, and, as an intrinsic functional property, it results in biphasic concentration–response curves with high- and low-sensitivity components corresponding to agonist binding in the α4β2 and α4α4 sites, respectively. Comparison of our homology models showed that only three residues differ between the two sites and signify a local change from hydrophilic in the α4α4 site to more hydrophobic in the α4β2 site (Fig. 3). The two sites are adequately similar for agonists to bind to both, but the three differing residues are expected to cause ligand-dependent differences in binding affinity between these two sites. The (α4)2(β2)3 receptor, which only contains α4β2 sites, display high agonist sensitivity toward ACh and NS3573, whereas the (α4)3(β2)2 receptor that contains the α4α4 site additionally display low agonist sensitivity (Table 1). Considering the potencies as a first approximation of the binding affinities in the activated receptor state predicts that ACh and NS3573 display higher affinity for the α4β2 sites and lower affinity for the α4α4 site. Along the same line, previous binding studies on α4β2 receptors expressed in oocytes have indicated both high and low affinity binding sites for [3H]epibatidine, with the majority of the sites displaying high affinity (Shafaee et al., 1999). In our initial experiments, we used 1:4 and 4:1 ratios between α4 and β2 cRNA to obtain expression of (α4)2(β2)3 and (α4)3(β2)2 receptors, respectively. The receptors resulting from excess β2 display ACh and NS3573 concentration–response data that fit well to a monophasic Hill equation (Fig. 5A,C). Combined with the fact that the ACh potency is similar to what have been reported by others for (α4)2(β2)3 (Moroni et al., 2006; Zwart et al., 2006; Carbone et al., 2009), it shows that a 1:4 α4:β2 ratio is sufficient to obtain a uniform (α4)2(β2)3 receptor population. The case is less clear-cut for the receptors resulting from excess α4 because the concentration–response data for ACh and in particular NS3573 is best fitted to a biphasic Hill equation. Others have reported similar biphasic concentration–response curves from (α4)3(β2)2 receptors but, even with a 10:1 α4:β2 expression ratio, they concluded that the high-sensitivity component is attributable to a (α4)2(β2)3 receptor contamination (Carbone et al., 2009). If the biphasic concentration–response curves is attributable to coexistence of (α4)3(β2)2 and (α4)2(β2)3 receptors, one would expect the fraction of the high-potency component to diminish with increasing α4:β2 expression ratios. However, as depicted in Figures 5A and 6, A and B, the ACh concentration–response curves obtained on receptors resulting from 4:1, 20:1, and 100:1 α4:β2 expression ratios are very similar. The fraction of the high-sensitivity component does not decrease as we go to higher excess of α4 but remains ∼15% (Table 1), and there is no significant difference between the ACh datasets collected on receptors from 4:1 and higher α4:β2 ratios. The same was confirmed with the much more biphasic concentration–response curves of NS3573 (Figs. 5C, 6E,F); the fraction of the high-sensitivity component is independent of the expression ratio and remains ∼25% (Table 1). Expression of concatenated α4β2 dimers and tetramers in the presence of single α4 subunits should exclusively favor assembly of functional (α4)3(β2)2 monopentameric receptors as shown previously for the dimeric construct (Zhou et al., 2003). The resulting ACh and NS3573 concentration–response curves for concatenated constructs expressed with large molar excess of single α4 subunits were not significantly different from each other or from the curves obtained with high α4:β2 ratios (Fig. 6), and the fractions remained the same (Table 1). These results show that our (α4)3(β2)2 receptor populations are indeed uniform and that the biphasic response is an intrinsic functional property with partial activation at low agonist concentration and additional activation at high agonist concentration. With respect to current levels in the oocyte experiments, the general picture is one of lower current levels in receptors that are of (α4)2(β2)3 stoichiometry compared with receptors of (α4)3(β2)2 stoichiometry regardless of whether wild-type or mutant subunits were used (Table 1). This clearly indicates that the mutant subunits do not dramatically affect expression compared to wild-type subunits. Furthermore, because (α4)3(β2)2 receptors seem to display larger conductance than (α4)2(β2)3 receptors (Nelson et al., 2003), the current levels likely reflects receptor stoichiometry, i.e., number of α4 subunits, rather than different expression levels. Interestingly, it turns out that the three residues that differ between the α4β2 and α4α4 sites completely control the difference in agonist sensitivity between the two sites. By mutating three residues on the (−)-side of the α4 subunit, we altered a low-sensitivity α4α4 agonist binding site to closely resemble a high-sensitivity α4β2 site. Data from experiments with the mutant (α4m)3(β2)2 receptors using 4:1 and 100:1 expression ratios unequivocally showed an abolishment of any low-sensitivity component in the concentration–response curves, and the receptors displayed only high agonist sensitivity to both agonists tested (Fig. 5B,D; Table 1). The large mutant α4m subunit surplus as well as general current levels indicate uniform (α4m)3(β2)2 receptor stoichiometry in these experiments. The monophasic high-sensitivity concentration–response curves could be explained by the lack of agonist binding in the mutated α4α4 interface and activation only through agonist binding to the two α4β2 sites. However, because the three mutations were introduced to alter the low-sensitivity α4α4 site to closely resemble a high-sensitivity α4β2 site, the most likely explanation is that the mutant (α4m)3(β2)2 receptor contains three activation sites with similar high agonist sensitivity. This is further supported by the fact that receptors assembled from either wild-type or mutant α4 subunits and β2 in a 4:1 ratio result in total average currents higher than that obtained with the opposite ratio (Table 1), indicating sufficient expression levels and activation via three agonist sites. In the reverse experiment, we mutated the corresponding three residues on the (−)-side of the β2 subunit to alter the high-sensitivity α4β2 agonist binding sites to resemble a low-sensitivity α4α4 site. Concentration–response data for the resulting mutant (α4)3(β2m)2 receptors only display low agonist sensitivity corresponding to a receptor population containing only low-sensitivity agonist sites (Fig. 5B,D; Table 1). These results clearly show that the α4α4 interface contains a novel third agonist site, which display low agonist sensitivity to ACh and NS3573, whereas the α4β2 sites exhibit high agonist sensitivity. A physiological implication of the two distinct ACh binding sites in the (α4)3(β2)2 receptor is a significantly broadened dynamic response range to the endogenous neurotransmitter ACh. As a consequence, the (α4)3(β2)2 receptor has the built-in opportunity to respond at two different current levels depending on the ACh concentration in the synapse. Furthermore, the presence of a low-sensitivity agonist site in the α4α4 interface offers a possible explanation for the weak and infrequent ACh-induced responses observed from oocytes injected with only α4 cDNA (Deneris et al., 1989). A crucial part of the electrophysiological experiments is how the concentration-response data are fitted to monophasic or biphasic Hill equations and especially the use of fixed or variable parameters; the more variables allowed the more datasets fit “well” to monophasic Hill equations. Using variable parameters, which is a customary reported fitting routine, our ACh data from (α4)3(β2)2 receptors can be fitted to monophasic Hill equations with low Hill slopes and bottom of curves different from zero. However, regardless of variable parameters, the best-model F test prefers biphasic fitting for the NS3573 data obtained on (α4)3(β2)2 receptors at all the conditions we have tried. Assuming the same activation profile for ACh and NS3573, we decided to use a fitting procedure with fixed parameters (Hill slope = 1, bottom = 0) on a global scale, resulting in significantly better fits to biphasic Hill equations for ACh data obtained on (α4)3(β2)2 receptors. Based on our results, it is crucial to acknowledge that the (α4)3(β2)2 receptors contains two different ligand binding sites, and we strongly argue for the importance of using fixed parameters in analyzing data from receptors of both stoichiometries. For the first time, we present a detailed explanation for the observation of both high and low sensitivities for many agonists on the α4β2 nAChRs, and the acknowledgment of a third agonist site in the (α4)3(β2)2 receptor subtype provides new opportunities for drug discovery. Based on the comparison of our homology models, the structural differences between the α4β2 and α4α4 sites appear to be sufficient for structure-based design of ligands selective for one site over the other. Ligands selective for the α4α4 site is of particular interest because they would specifically target the (α4)3(β2)2 receptor subtype, which is the dominantly expressed subtype (∼70–80%) in native rat brain (Shafaee et al., 1999) and thus may be the pharmacologically most relevant subtype. Furthermore, a compound that selectively binds to the α4α4 site should in theory function as an allosteric modulator with negligible efficacy on the (α4)3(β2)2 receptor without an agonist present and with no effect on the (α4)2(β2)3 receptor. Single-channel measurements have implied that the (α4)3(β2)2 receptor displays larger conductance than the (α4)2(β2)3 receptor (Nelson et al., 2003), and the same has been reported for (α3)3(β4)2 versus (α3)2(β4)3 (Krashia et al., 2010). Combined with results obtained on homomeric receptors (Rayes et al., 2009), it seems to be a general mechanistic feature of the nAChRs that agonist binding to three sites results in maximal activation. This may also apply to other Cys-loop receptors, e.g., the GABAA receptors in which the accessory γ-subunit adds additional plasticity to the channel activation through the benzodiazepine binding site (Atack, 2005) and thus functions similarly to the third α subunit in the nAChRs. As suggested above, affecting a specific receptor subpopulation by developing compounds that bind to a subunit interface, which is only present in the receptor subtype of interest, may be a meaningful drug discovery strategy for Cys-loop receptors in general. As illustrated by the number of drugs affecting the benzodiazepine binding site, this strategy has successfully been applied in development of modulators for the GABAA receptors. This work was supported in part by grants from the Lundbeck Foundation (T.B. ), the Carlsberg Foundation (T.B., K.H. ), and the Drug Research Academy, Faculty of Pharmaceutical Sciences, University of Copenhagen (K.H.). We thank Camilla Irlind and Lene G. Larsen from NeuroSearch A/S for expert technical assistance. (2006) Expresso: automatic incorporation of structural information in multiple sequence alignments using 3D-Coffee. Nucleic Acids Res 34:W604–W608. (2005) The benzodiazepine binding site of GABAA receptors as a target for the development of novel anxiolytics. Expert Opin Investig Drugs 14:601–618. (2000) The Protein Data Bank. Nucleic Acids Res 28:235–242. (2009) Pentameric concatenated (α4)2(β2)3 and (α4)3(β2)2 nicotinic acetylcholine receptors: subunit arrangement determines functional expression. Br J Pharmacol 156:970–981. (2004) Nicotine and carbamylcholine binding to nicotinic acetylcholine receptors as studied in AChBP crystal structures. Neuron 41:907–914. (2002) The PyMOL molecular graphics system, version 1.3 (Schrodinger, New York). (2007) Crystal structure of the extracellular domain of nAChR α1 bound to α-bungarotoxin at 1.94 Å resolution. Nat Neurosci 10:953–962. (1989) Genes encoding neuronal nicotinic acetylcholine receptors. Clin Chem 35:731–737. (2005) Structures of Aplysia AChBP complexes with nicotinic agonists and antagonists reveal distinctive binding interfaces and conformations. EMBO J 24:3635–3646. (2005) Neuronal nicotinic acetylcholine receptors: structural revelations, target identifications, and therapeutic inspirations. J Med Chem 48:4705–4745. (2002) The β subunit determines the ion selectivity of the GABAA receptor. J Biol Chem 277:41438–41447. (2010) Human α3β4 neuronal nicotinic receptors show different stoichiometry if they are expressed in Xenopus oocytes or mammalian HEK293 cells. PLoS One 5:e13611. (2005) Nicotine acts as a pharmacological chaperone to up-regulate human α4β2 acetylcholine receptors. Mol Pharmacol 68:1839–1851. (2007) Gene targeting demonstrates that α4 nicotinic acetylcholine receptor subunits contribute to expression of diverse [3H]epibatidine binding sites and components of biphasic 86Rb+ efflux with high and low sensitivity to stimulation by acetylcholine. Neuropharmacology 53:390–405. (2008) NS11394 [3′-[5-(1-hydroxy-1-methyl-ethyl)-benzoimidazol-1-yl]-biphenyl-2-carbonitrile], a unique subtype-selective GABAA receptor positive allosteric modulator: in vitro actions, pharmacokinetic properties and in vivo anxiolytic efficacy. J Pharmacol Exp Ther 327:954–968. (2006) α4β2 nicotinic receptors with high and low acetylcholine sensitivity: pharmacology, stoichiometry, and sensitivity to long-term exposure to nicotine. Mol Pharmacol 70:755–768. (2008) Non-agonist-binding subunit interfaces confer distinct functional signatures to the alternate stoichiometries of the α4β2 nicotinic receptor: an α4-α4 interface is required for Zn2+ potentiation. J Neurosci 28:6884–6894. (2003) Alternate stoichiometries of α4β2 nicotinic acetylcholine receptors. Mol Pharmacol 63:332–341. (1999) Heteroaryl diazacycloalkanes as cholinergic ligands at nicotinic acetylcholine receptors. PCT Patent WO 99/21834. (2009) Number and locations of agonist binding sites required to activate homomeric Cys-loop receptors. J Neurosci 29:6022–6032. (1993) Comparative protein modelling by satisfaction of spatial restraints. J Mol Biol 234:779–815. (1999) Pharmacological similarities between native brain and heterologously expressed α4β2 nicotinic receptors. Br J Pharmacol 128:1291–1299. (2006) Statistical potential for assessment and prediction of protein structures. Protein Sci 15:2507–2524. (2007) Ca2+ permeability of the (α4)3(β2)2 stoichiometry greatly exceeds that of (α4)2(β2)3 human acetylcholine receptors. Mol Pharmacol 71:769–776. (2011) Ongoing and future developments at the Universal Protein Resource. Nucleic Acids Res 39:D214–D219. (2007) An allosteric modulator of the α7 nicotinic acetylcholine receptor possessing cognition-enhancing properties in vivo. J Pharmacol Exp Ther 323:294–307. (2003) Human α4β2 acetylcholine receptors formed from linked subunits. J Neurosci 23:9004–9015. (2006) 5-I A-85380 and TC-2559 differentially activate heterologously expressed α4β2 nicotinic receptors. Eur J Pharmacol 539:10–17.